Harness Maker Tools & Etc. Payment by Visa, Master Card, C.O.D., Money Order or Pay Pal. C.O.D. orders under $200.00 will have a $7.75 C.O.D. charge added on invoice. We try to ship the most economical way, usually by UPS, DHL or Canada Post. (Larger shipments will be made by transport). UPS for overseas. Please specify if another method is preferred. These will be shipped as our stock becomes available. NOTE: Any back orders over 2 months will be cancelled, except special orders. If cancelled orders are still required, please reorder. If for any reason you are not completely satisfied with any of our products that you have received, please contact us for an exchange or refund. Returning products for any other reason are subject to a 15% restocking charge with prior authorization from our staff. NOTE: HST will be added on the invoice to customers in Ontario, Nova Scotia, New Brunswick and Newfoundland. Nous offrons maintenant le service à la clientéle en français. Ils peuvent répondre à vos questions concernant nos produits et vous aider à placer vos commandes. Vous pouvez communiquer directement avec eux ou nous pouvons vous transférer. Periodically we have good used harnesses, collars and pads for sale. If interested give us a call to see what we have at that time, or check us out on our website (Used & Clearouts). We also buy or trade-in used harnesses depending on the kind and condition. Another option we have is to sell your used harness on a consignment basis where we charge only a small fee for handling. Now and then we make halters, shanks, harness parts, etc. from clearout materials at very low prices. So, when you write or call, ask about our specials, clearouts or seconds. 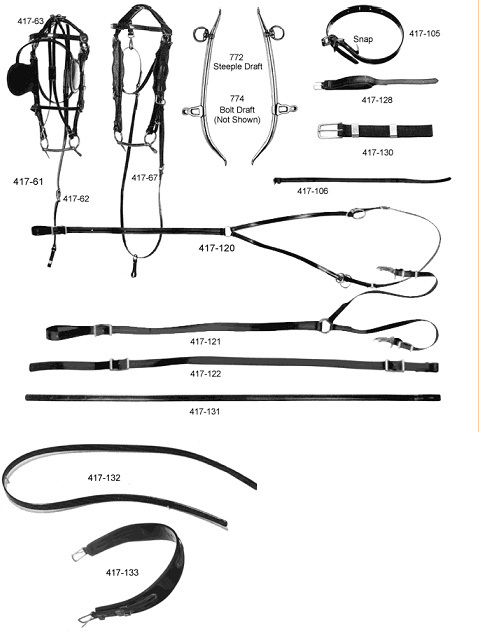 Harnesses may be brought or shipped in for repairs, cleaning or oiling. Cost estimates available at that time if required. Aaron Martin Harness Ltd. © 1999 - All Rights Reserverd.